In Old Uppsala lie the remains of one of Scandinavia’s most fascinating royal estates from the Iron Age. Once there were numerous houses and other buildings here, which visitors up until now have had to imagine from sketches. A new app called ‘Augmented History – Gamla Uppsala’ is changing this. Old Uppsala is one of Sweden’s most well-known historic sites, known for its many burial mounds and for being the former home of kings who counted the god Frey himself as their ancestor. Even if visitors now can be impressed by the large burial mounds, these only make up part of the area’s character and content. Once the area featured a great number of houses, even more graves and other monumental buildings. Archaeological research has generated a lot of knowledge over the years, but it has long been difficult to show visitors what the area actually looked like. Now, however, researchers at Uppsala University together with game designers and software developers have created a downloadable app for iPad to help improve the situation. ‘By using the GPS, compass and gyroscope features in smartphones and tablets it becomes possible to move through long-gone times and environments. As an added bonus, the user can discover virtual archaeological objects and collect them in a bag – just as in Pokemon Go – and at the same time receive information about these objects’, says John Ljungkvist, researcher at the Department of Archaeology and Ancient History at Uppsala University. The app shows the site to visitors as it was roughly 100 years before the actual Viking Age, when all known large monuments were built but hadn’t yet been damaged by later activities and construction work. Visitors can experience the enormous hall in its majestic, elevated position on the plateau next to the church. This hall may have been the actual Uppsalen (literally translated Up hall) which gave its name to Old Uppsala and indirectly today’s Uppsala. ‘This is the first time this kind of technology is being used to enhance the experience at a landmark in Sweden. We hope this model can be used for more places and in more contexts, both to heighten the experience and to communicate research results’, says John Ljungkvist. The app Augmented History – Gamla Uppsala 1.0 was launched on archaeology day, 28 August 2016. Visitors to the Old Uppsala Museum are offered to borrow iPads with the app installed, or to download the app to their own devices from Apple’s App Store. The next step will be to make the app available on Android too, as well as developing the option to use the app off-location. 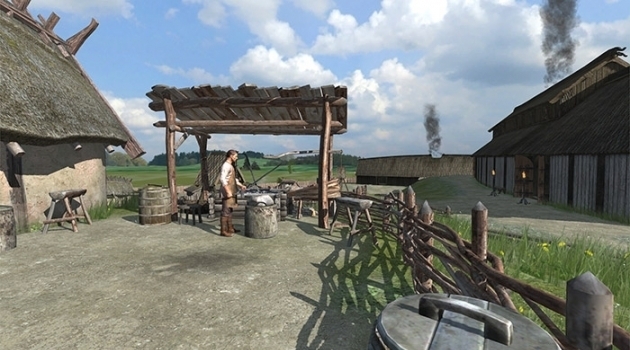 The app development has been funded through the research projects ‘Old Uppsala – the establishment of a mythical centre’ and ‘The Viking Phenomenon’ at Uppsala University, as well as Uppsala Regional Council and the Old Uppsala Museum, who together have contributed knowledge and resources towards the visualisation of what the site may once have looked like. The result is an app which gives the visitor a window into history and an opportunity to explore 7th-century Old Uppsala. The app, which to a large extent has been developed pro bono with a strong commitment from both researchers, 3D animators and developers, shows how research results together with game technology can enhance the experience of historic environments without affecting the ancient remains themselves.